You’re busy, your life is hectic, you don’t have a lot of time for job searching, and you don’t want to be stuck to your laptop or use your work computer to job hunt. You don’t need to. Just like almost everything else in your life, job searching has gone mobile and you can do it on the go. There are many apps out there that can help you find your dream job easily. We searched and we discovered one highly practical and helpful app for this specific purpose. Let’s see what this app offers you. What is HiJob Job Search about? HiJob Job Search is a business app developed on both android and IOS platform, especially created for all users that want to find their dream job quick and simple. This app is highly helpful and easy to use, connecting people with local job opening in their area. Constant notices and updates about new job openings. The users can find jobs from many categories, as travel jobs, salon and health care jobs, retail and hotel jobs, student jobs, contacting with recruiters and sending their applications with one click on the app. This app is a highly productive and practical tool for finding the right job without spending much time looking. This app offers smart search engine that helps the users find a job looking through categories or by choosing a location. The users are also able to use the interface for easier navigation through the app with chats and profiles. 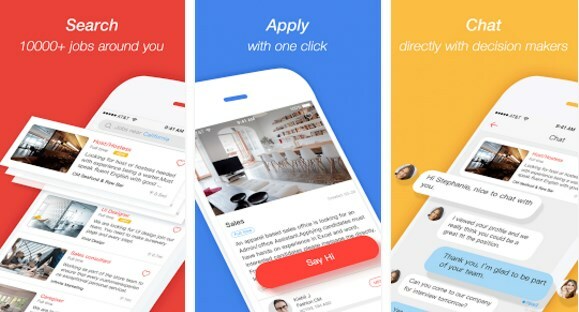 The app also offers a live chat for users to connect with many recruiters and employers, conducting their mobile interviews in real time for quick hiring. The application is simple, only one click, and the users can send their applications, using the job management system they can track their application to see if they are qualified. The users are always secure and protected while searching for jobs.